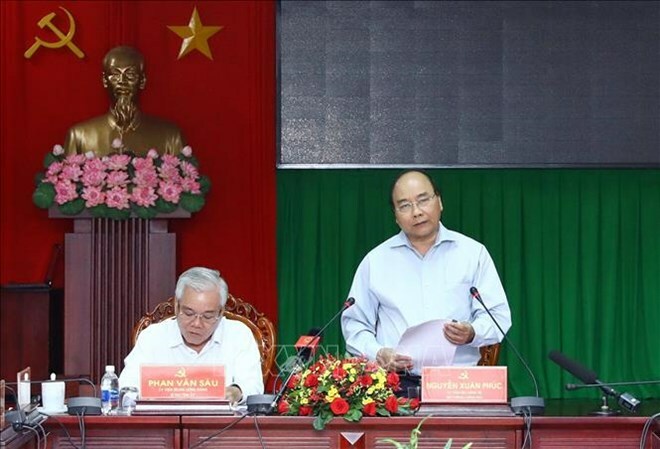 Soc Trang (VNA) –The Mekong Delta province of Soc Trang should make strong economic structure shifting for achieving major breakthroughs in the socio-economic development in 2019, said Prime Minister Nguyen Xuan Phuc. At a working session on April 6 with the local leaders on local socio-economy and security and defence in the first quarter of 2019, PM Phuc stressed that developing high-tech agriculture adapting to climate change, a complete seafood value chain, and clean energy models play an important role in the economic structure shifting. In addition, production should be expanded, development of private firms and cooperatives must be prioritised, and local authorities should move to attract investments from prestigious corporations, he said. PM Phuc asked local authorities to pay heed to improving education, the quality of human resources, ethnic minority and religious affairs and social management. On the occasion of the Khmer New Year Festival or Chol Chnam Thmay, he requested authorities at all levels to timely give support to the impoverished, ensuring that all the Khmer people enjoy a warm traditional festival. Earlier, PM Phuc visited and delivered New Year greetings to the Association for Solidarity of Patriotic Buddhist Monks and Pali school, and offered incense at Khleang pagoda in the province. According to the province’s report, Soc Trang achieved stable agricultural production, and increases in the production value as well as retail sales in the first quarter of this year. Social welfare policies were carried out in a full and timely manner, and Party and political system building was comprehensively implemented as well.